The idea was to make a hoop with a threaded bar through the middle that would clamp 2 plates together. The hoop was designed to accommodate plates up to 235mm wide. 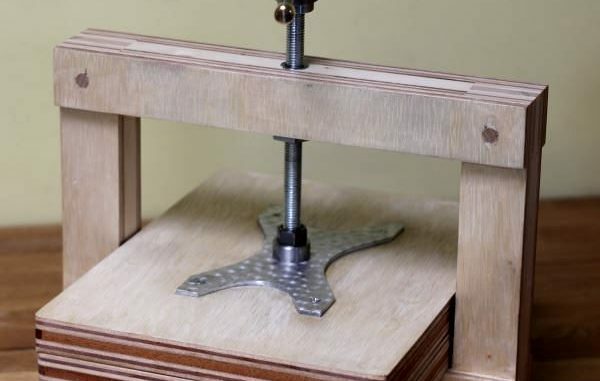 This would allow a piece of A4 size paper to fit easily into the press. 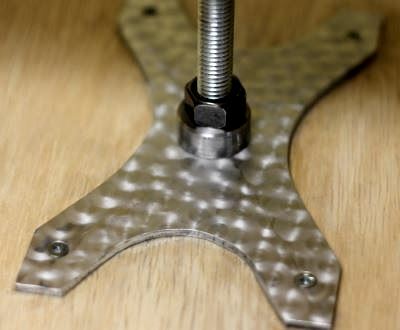 The maximum height is 145mm, but that will decrease with pressing plates and some space for the nut flange. 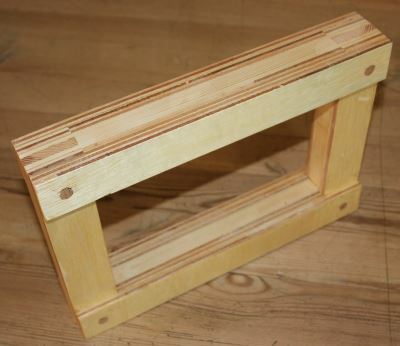 The inner layer is a frame of 44mm x 18mm pine that has been jointed at the corners. Once the pine frame had set layers of 9mm plywood were added, all glued in place with Titebond Original. The horizontal beams have an extra layer of plywood each side, I decided on this approach as these will be in bend. 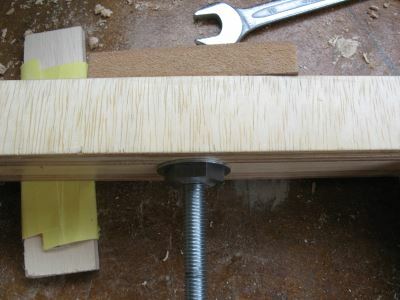 I drilled a 10mm diameter hole and then a tight fitting oak dowel that was covered with a liberal layer of titebond glue and then hammered into place, making sure that the other side was resting on a piece of old wood with a 10mm hole in it. This allowed me to hammer the dowel through the joint. I allowed the glue to set and then sanded the excess off. 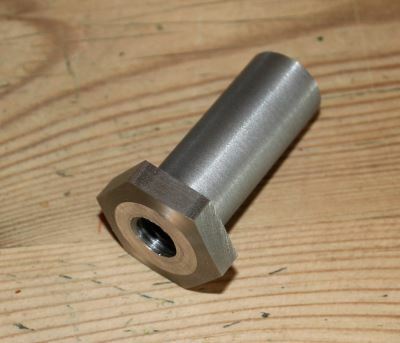 The nut is 46mm long overall with a 5mm thick hexagonal end and an M12 x 1.75mm thread. This nut was made from a piece of mild steel hexagonal bar that I had in my metal store. For this thread you need a 10.2mm pilot hole, I drilled this hole in stages on the lathe so that I could get as close to the definitive size as possible. The lathe in question was a Warco WM240B. The nut and M12 long bolt. 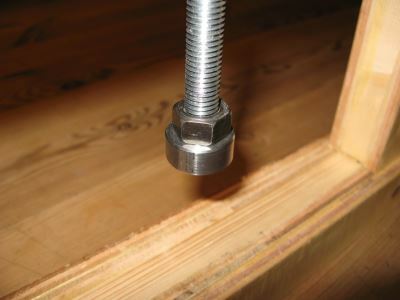 The nut is very long and so there is a lot of contact with the bolt. 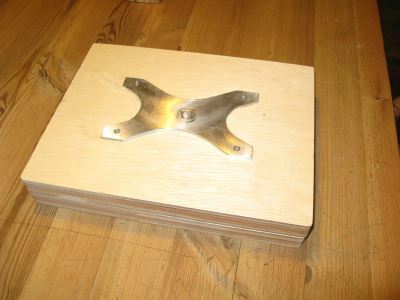 This should mean that I will be able to get a good pressure applied in the press – assuming the wood and the joints hold. I drilled an 18mm diameter hole with a flat wood bit and then located the nut with a bolt ready to pull into the hole. An offcut of MDF was used so that I didn’t damage the top surface of the main beam. I used Araldite extra strong 2-part epoxy, so measure out equal amounts. I use old plastic lids from coffee cans or jar lids. Mix thoroughly and then apply. The nut was then bolted up into place and tightened. Note that I used an old piece of wood on the top to protect the frame and also that I added a metal washer to the nut to spread any load into the frame. I wanted this press to work with a maximum of A4 size paper. 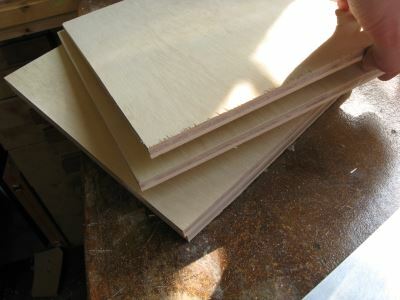 Here are the boards with a rough piece of A4 laying on top to show that I’ve made them slightly larger all-round. 4 off boards of 9mm thick plywood. 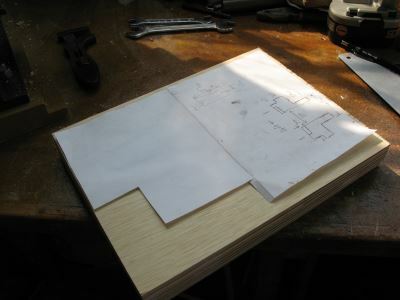 The idea is that I will have 2 boards glued together for each plate – to make the boards stronger I spaced the boards apart with hardwood. Note that when sawing this be careful as there is a tendency for any saw to splinter the edges. I cut some 6mm thick mahogany strips so as to space each pair of boards and create a thick sandwich that would add more strength. Why mahogany? Well I just thought it would look nice in between the plywood. 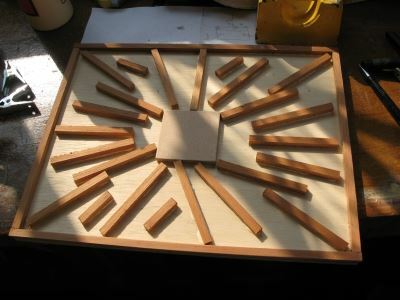 Why small pieces and not cover the area? Well, I didn’t have enough and I wanted to keep the weight down a bit. All glued and lots of clamps and the wood vice holding it all together. 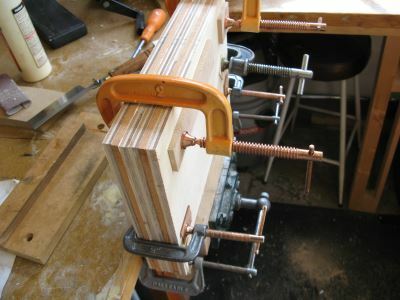 I use lots of off-cuts of wood as protective pieces for the clamps. Also, note that I clamped the 2 plates, each made from 2 boards, together so that they would hopefully remain flat and close together in surface shape. I always leave the glue with the mixing stick on the side so that I can check when it is no longer workable and when it has set. 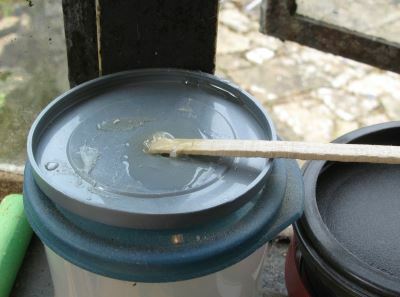 Also, if you leave the glue on the lid then when it is set you can flex the lid and remove the glue. 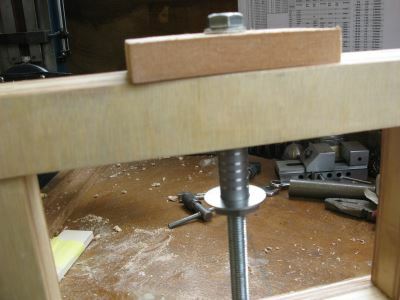 The press in it′s basic form with the bolt in place. 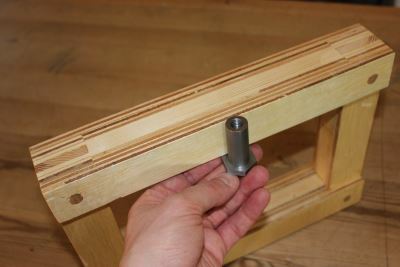 This looks nice, but I need a handle and the aluminium plate needs tidying up before fixing to the top board so that it can spread the load from the bolt into the wood. The final aluminium plate (3mm thick) shaped to just look better than a rectangular shape and fixed again with araldite and 4 woodscrews. Rough up the underside of the aluminium so that the araldite adheres really well. The end of the bolt left marks in the aluminium plate and so I made up a washer that was threaded and that I could then fix to the end with thread locker and a locking nut. 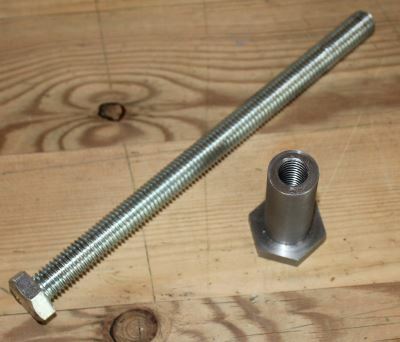 The handle, a piece of hexagonal steel machined in the lathe and threaded to fit onto the bolt, again I used thread locker to fix this in place. 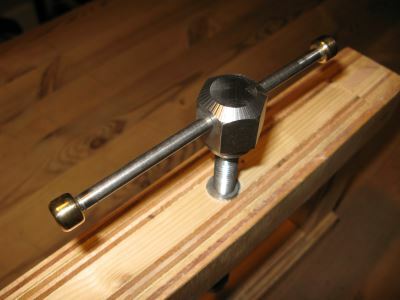 The handle is 6mm steel rod threaded at each end and then fixed brass beads on each end. This allows the handle to be lengthened to increase the torque you can apply. A bit random, but the finishing touch was to engine turn, in the crudest sense, the aluminium plate. I used a brass wire cup brush that had seen better days (so short wires) in a Dremel running at around 20000rpm and very light pressure – literally just touch the plate and off again. 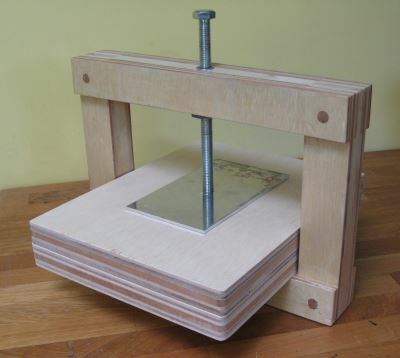 We have been using this as a family to press flowers, for lino printing, for holding sheets together whilst they dry – there are lots of uses.